Golden Seal plant, Hydrastis canadensis, is a premier tonic herb. A wide range of traditional uses of the root, primarily where an astringent action is required. Roots yield a yellow dye or black dye, depending which mordant is used. Golden Seal plant is native to Canada and the USA and prefers rich moist soils in a protected shaded position. Produces small white flowers in late spring or early summer. Frost resistant but drought tender. A rhizome based herbaceous perennial plant, growing to 0.3m x 0.5m. 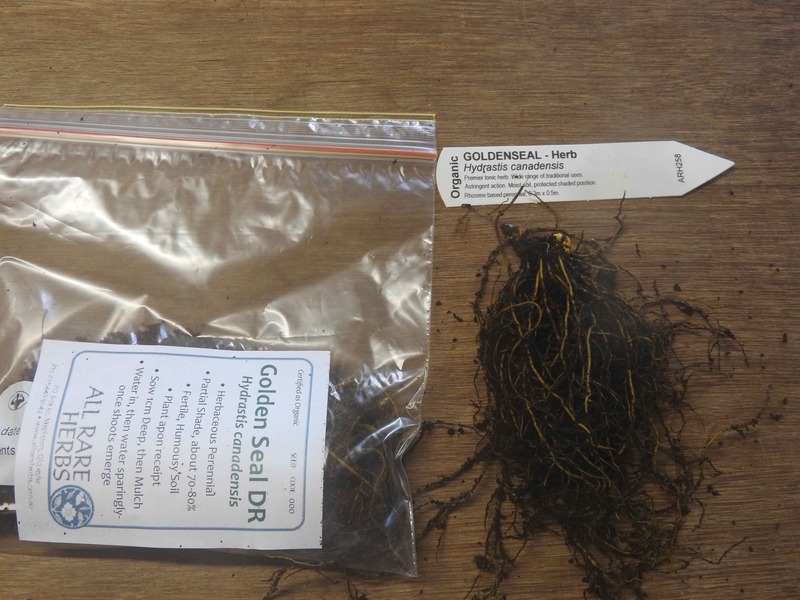 Golden Seal plants are shipped while dormant as bare roots and packed in coir. Plants should be transplanted while still dormant. Freight included in the price. NOTE: Golden Seal plants are delicate and can be difficult to grow. Suitable for cultivation by competent plant growers. If you are not confident in your ability to grow difficult plants, then do not order this species – no refunds and no replacements. Be the first to review “Golden Seal plant, delivery July 2019” Click here to cancel reply.